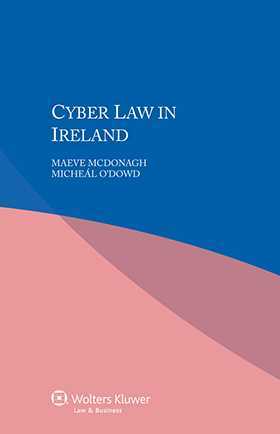 Derived from the renowned multi-volume International Encyclopaedia of Laws, this practical guide to cyber law – the law affecting information and communication technology (ICT) – in Ireland covers every aspect of the subject, including intellectual property rights in the ICT sector, relevant competition rules, drafting and negotiating ICT-related contracts, electronic transactions, privacy issues, and computer crime. Lawyers who handle transnational matters will appreciate the detailed explanation of specific characteristics of practice and procedure. Its succinct yet scholarly nature, as well as the practical quality of the information it provides, make this book a valuable time-saving tool for business and legal professionals alike. Lawyers representing parties with interests in Ireland will welcome this very useful guide, and academics and researchers will appreciate its value in the study of comparative law in this relatively new and challenging field. Chapter 1. General Background of the Country. Chapter 4. E-Commerce Facts and Figures. Part I. Regulatory Framework of the ICT Sector. Chapter 1. Regulatory Framework of the Telecoms Sector. Chapter 2. Regulation of Competition in the ICT Market. Chapter 3. Regulation of Cryptography and Other Dual-Use Goods. Chapter 4. Legal Status of Standardization. Chapter 5. Legal Status of Out-of-Court Dispute Settlement. Chapter 1. Application of Copyright in the Area of ICT. Chapter 2. Legal Protection of Software. Chapter 3. Legal Protection of Databases. Chapter 4. Legal Protection of Computer Chips. Chapter 6. Copyright and the Internet. Chapter 6. Cloud Computing Agreements. Chapter 1. Legal Status of Electronic Transactions. Chapter 2. Regulation of Electronic Signatures and Certification Services. Chapter 3. Legal Aspects of Electronic Banking. Chapter 4. Protection of Users of Electronic Services. Chapter 1. Introduction to the Law of Negligence. Chapter 2. Liability of Network Operators and Service Providers. Chapter 1. Regulation of Personal Data Processing. Chapter 2. Protection of Telecommunications Privacy. Chapter 1. General Legal Development. Chapter 2. Application of Substantive Criminal Law.